Arabel Lebrusan, a Spanish jewellery designer and previously Creative Director at sustainable jewellery brand Leblas, now designs under her own name creating statement jewellery combining trend-led designs, fine jewellery and bespoke collections. Graduated with a MA in Jewellery Design from Central St. Martins, Arabel is a trained gemologist which is apparent when you view her extensive collections. With inspiration taken from her background and travels, Arabel made the choice of using Ethical and Fairtrade metals and stones, allowing beauty on the inside and outside of her jewellery. 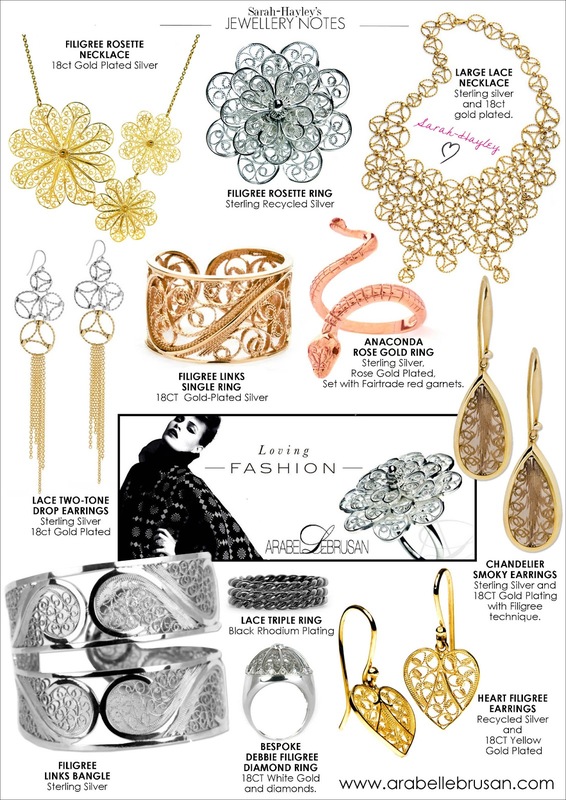 My favourite collection is the 'Filigree' which use an artisan technique. Silver is translated into lace like patterns, delicately curving into the prettiest forms. These stunning pieces, all handmade, are made by Spanish artisans who were taught this special trade from their fathers and grandfathers before them. My favourite piece is one of the most striking necklace. Hand assembled from over 60 pieces, the 'Lace Necklace' has fabulous movement and fluidity. Fragile in appearance this flattering necklace is guaranteed to add a dramatic touch to any outfit, especially when worn with a scoop neckline or strapless evening outfit. I would also style the Lace Necklace over a roll-neck jumper to add interest. Arabel also offers a bespoke commission service, allowing you the opportunity to combine Arabel's design flair and your personal brief. You will see my other picks by Arabel Lebrusan, below. You can 'shop the page' with the usual links at the bottom. Anaconda Ring - Part of the proceeds to the Water Project.